Wow, big mention yesterday on the Jalopy Journal. We built the carbs and a double tricky linkage for the Y-block mounted 4×2 blower plate for their Project 38 nostalgia drag racer. And it all turned out real nice. 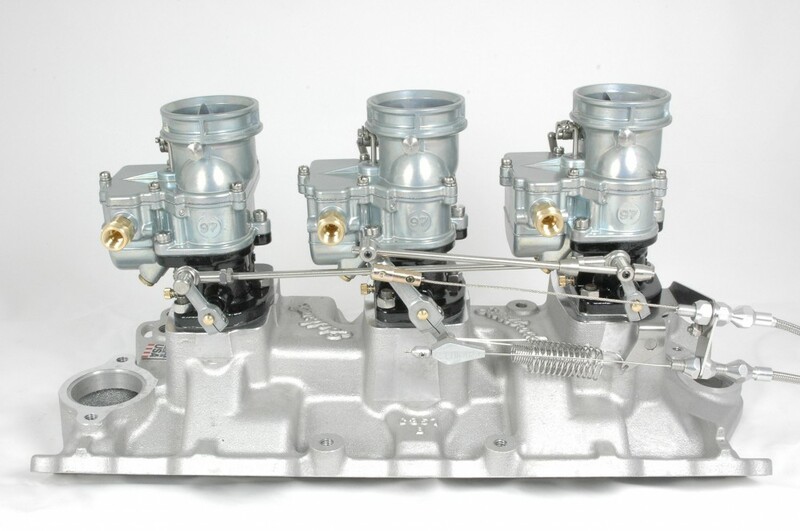 Our buddy and Stromberg reseller Aaron Von Minden supplied one of his 6-deuce tops for 6-71 blowers and the car’s builder, Keith Tardel, cut and shut it (awesomely, I might add) into a very cool and unique 4-carb blower plate. So why so tricky? 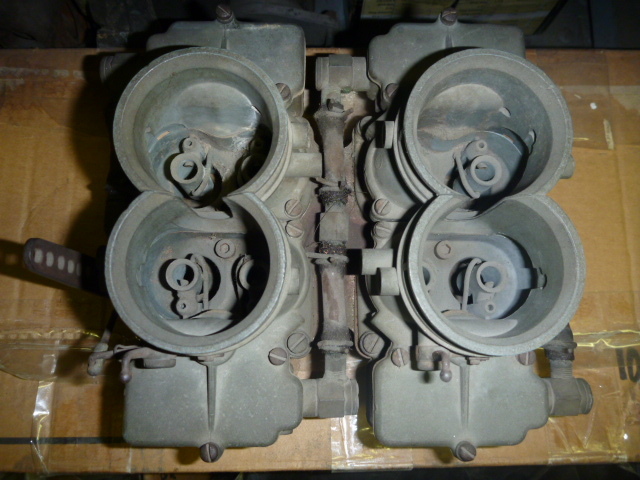 Man, these carbs sat so close to each other that the accelerator pump rods were touching the carb in front! 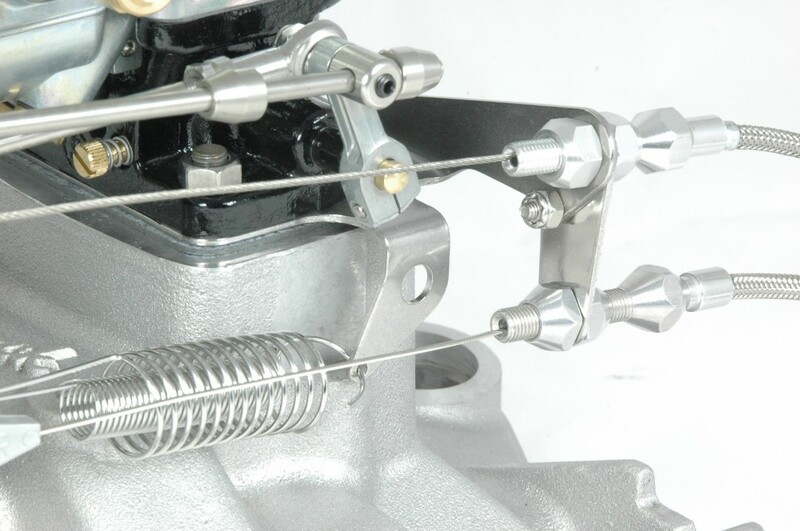 There is no space to get any linkage in between the carbs so we made some cool stainless steel throttle shaft extensions to get the right-side carburetors to meet the left hand linkage, but the fat ends literally hit the jet plugs on the left-side carbs. We solved that with a further lathe visit to skinny them up, then our ace fabricator Rick P made up some little support brackets with oilite bushes to keep the extension ends from waving back at us in the breeze. Next? Well, race cars need a rod end linkage so we made each carb link individually adjustable – four swivels linked together on a straight rod like a convict work party just wouldn’t cut it. We didn’t want weird-looking short links either. Rick came up with this crazy plan involving two levers on the front carb. Good on the intake and good on the eye too. But even then we had to shave some iron off the left-hand bases to ensure unhindered WOT on all four carbs (..too close together!). Remember that crazy Navarro 4-carb deal we posted recently? That was for a blower plate too. Same issues…no space. Anyway, problem solved. You can read all about it on the Jalopy Journal.. Looking for a place to mount your fuel pressure gauge? Look no further. We’ve just finished these neat ‘fuel gauge banjos’ which allow you to check the fuel pressure right at the carb. They have all the benefits of our super-popular stainless steel single and double-end banjo fittings, but with an 1/8th NPT hole in the end of the bolt to accept your hot rod fuel pressure gauge. Part numbers? 9082K-G for the single end, and 9083K-G for the double-end banjo. That’s G for gauge, right? Genius..
Just to remind everyone, Stromberg banjo fittings use large diameter stainless steel material with a recess lip on each side to hide the gasket and move the bolt head closer to the banjo. We had to increase the wrench surfaces a little on these models to give us enough meat for the NPT thread in the end, but we still knocked the corners off the hex and rounded the bolt head too. The banjos are sized to fit both 5/16inch and 3/8inch hose, and plenty of fuel flow is guaranteed. One word of warning. 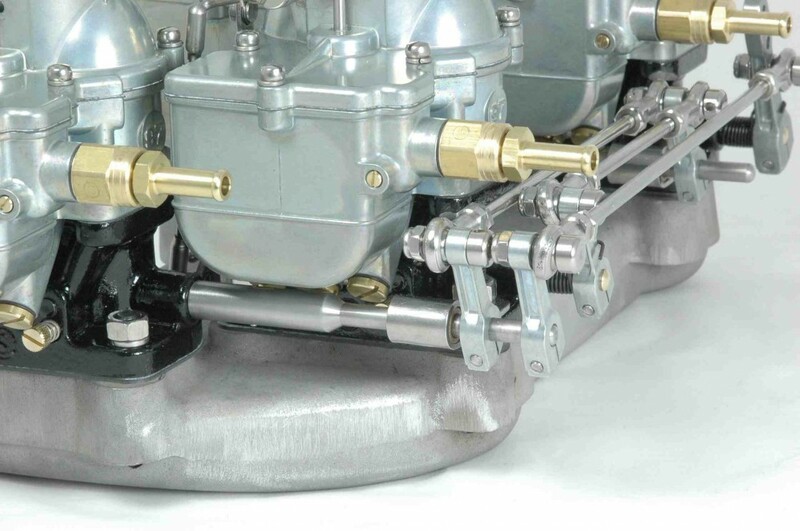 Don’t use them with a 3×2 progressive linkage (as the fuel line and centre carb lever want the same space) until we launch our new stainless banjo spacers. Smart solution coming soon! 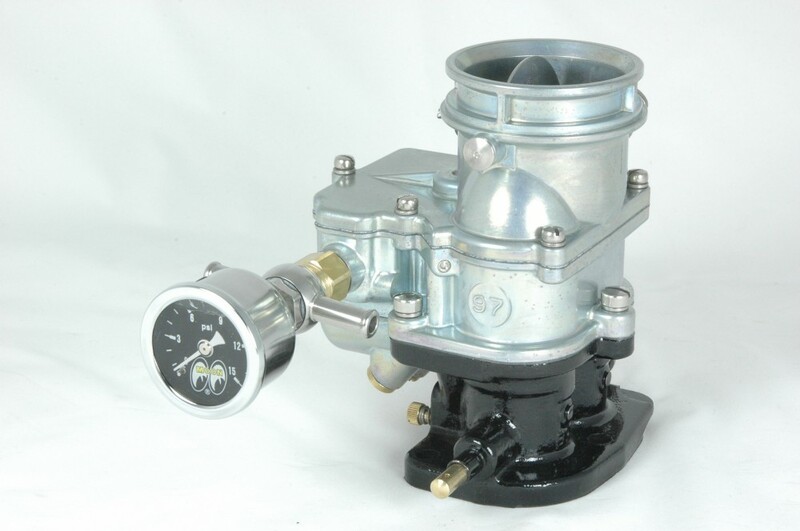 Knowing your fuel pressure is all the more important with Stromberg 97 carburetors, because you need to ensure 2.5psi max, of course. So if you already have Stromberg banjos (9082K or 9083K), and want to add a fuel pressure gauge to your line, you can buy just the replacement bolt. Ask for 9084K-G. All three new kits can be viewed on the Stromberg website right now, so ask at your favourite Stromberg dealer today! Navarro 8-barrel Stromberg 48 carb Update !! I think I can shed some light on this crazy 4×2 setup. I wrote the story about Navarro’s roadster in the February ’10 R&C. Barney built that car in the late ’40s—as far as we can tell his engine and the one he built for his then-employee Tom Beatty were the first Flathead Fords if not first V-8 engines ever to get Roots-type superchargers. So that sort of goes with the story that this assembly came to pass in the late ’40s. The engine that Barney built for that car reportedly exists but Scott Perrott said he couldn’t talk the owner out of it and that it lacked the blower and carburetor adapter anyway. He was forced to recreate the induction system and he did so by Barney’s instructions. Here’s how he described it. Click here for a photo of the finished product. Now did Barney remember exactly how he built that induction system? If so, did Scott understand exactly what Barney described? Supposedly Barney approved of the recreation but there’s a chance that he would’ve politely nodded in approval even if they got it wrong. I met Barney once or twice and he seemed like a thoughtful man.